Established in late 2010 by Dr. Sheikh Ahmed bin Saif Al‐Nahyan, Rotana Jet operates both Executive Charter and Scheduled Airline services With its main operating base at Al‐Bateen Airport, situated only 10km from the City Centre of Abu Dhabi, Rotana Jet is uniquely located for corporate clients and domestics passengers alike. In the air and on the ground, Rotana Jet continues to set service standard benchmarks in terms of Safety, Quality and Customer Service. The Executive Charter fleet consists of the legendary Gulfstream G450, the market leader in its segment with true intercontinental capability for up to 16 passengers. In August of 2012, the G450 was joined by a new Airbus A319ER in a bespoke 50‐seat configuration capable of flying non‐stop from Abu Dhabi to London, Singapore, Johannesburg or Casablanca. The Regional Airline Fleet currently consists of two (2) Embraer ERJ‐145 and an Embraer ERJ-145 LR Jet in a 50 seat configuration with the ability to join city pairs in the GCC and MENA region. 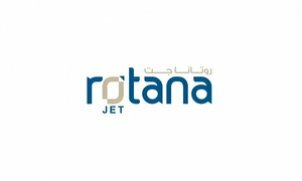 In addition to the charter and scheduled operations, Rotana Jet has established a Technical Operations division providing aircraft maintenance and component support for the G450 and ERJ145 aircraft from its 2,500m2 maintenance facilities at Al‐Bateen Airport. The Management Team at Rotana Jet has extensive operational and commercial experience having previously held executive management positions with established and respected organizations world‐wide. Rotana Jet actively supports the continued and sustainable growth in the UAE and Arabian Gulf region. As a true market innovator, Rotana Jet has carefully aligned its aggressive growth strategy with the vision and goals of the Government of Abu Dhabi. Rotana Jet will continue to expand its fleet, capabilities and route network to meet the dynamic needs of the market whilst delivering new and innovative products and services. We look forward to welcoming you on board soon.